Waves of Creativity: Inky Doors! After 6 weeks of exams at the local school I have at last had chance to play! I had a request to use Oak House Studio's Ink in a Bottle and that's what I've done to create a door hanger. A while back I entered a challenge where we had to make something using the colours of our front door....well mine is white pvc but it does have a stained glass kingfisher in it so lots of blues, oranges and greens. For more details of this project check out the Oak House Studio blog. I've used Jubilee Blue, Citrus Lime, Peacock Green, Citrus Yellow, Citrus Orange and Jubilee Red Ink in a Bottle - it soaks into wood and card beautifully giving you a soft look or a really intense colour!! 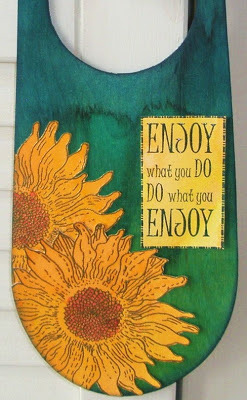 All the Inks in a Bottle, Pigment Ink Pads, Sunflowers and Enjoy Stamps I used can be found here. Thanks for taking the time to look. Lynnda is having a give away so don't forget to leave a comment on the post here for your chance to win some Inks in a Bottle!! 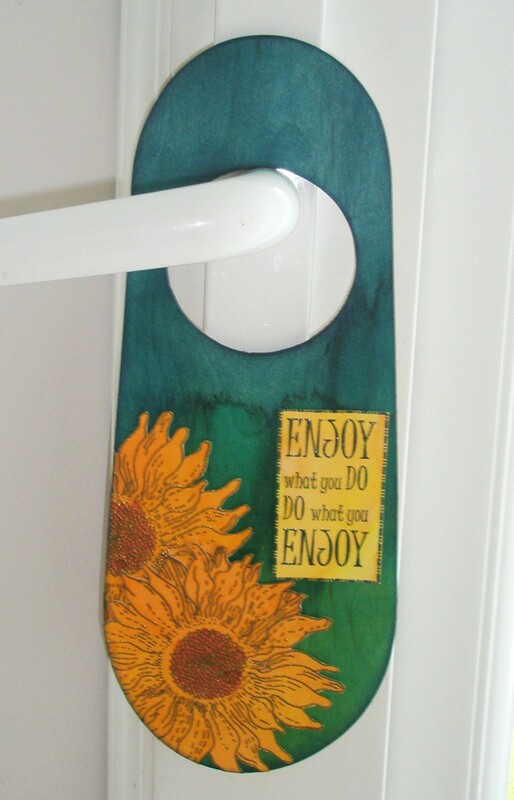 Love the vibrant coloured background on your door hanger, the beautifully coloured sunflowers look fabulous against it. Wonderful - I sure do love my British friends - you all are so very creative!